Often when we want to understand attitudes, beliefs and assumptions we rely on intuition, instinct or we make quick guesses, but that’s unsatisfactory and unfulfilling. What happens is we try to dominate a narrative without paying too much attention to how people are hearing us. The question is, do we really understand our audiences before we market to them, before we try to shape their thinking, before we try to move them to action? We spend a lot of energy understanding what we want. Do we spend sufficient energy understanding what they want? Those are good questions considering President Obama’s request this week that German’s “give us the benefit of the doubt” regarding NSA tapping Chancellor Angela Merkel’s phone and gathering private information from Germans. According to Doug Randall, Founder and CEO of Monitor-360, narrative analysis is the discipline of using our understanding of what other people are thinking to shape our communication. Rather than focusing attention on the message that we want to deliver, narratives enable us to understand how messages are heard. Do we actually know our audiences as much as we would like to? Master narratives are linked to aspiration; to agreements and to hopes and fears. It is a very deep emotional concept that influences the way in which people’s attitudes and behaviors are shaped. The question then becomes can we identify these deeply held narratives around the world and among audiences that matter to us in any country, and then can we use our understanding of those narratives for advantage? 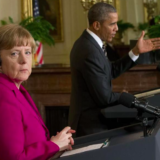 “There’s no doubt that the Snowden revelations damaged impressions of Germans with respect to the U.S. government and our intelligence cooperation,” Obama acknowledged this week in a press conference with German Chancellor Merkel. But the president quickly defended the importance of the NSA’s intelligence-gathering practices, showing impatience with German concern for the civil liberties related to privacy of personal information and technology. “I would like the German people to give us the benefit of the doubt as opposed to assuming the worst, assuming we have been consistently your strong partners and we share a common set of values,” Obama said. Germany will never forget the Nazi and East German governments’ shameful legacy. At the heart of their crimes was the secret police collecting and abusing citizens’ personal information. Germans learned that protecting citizens’ private lives is essential for a society in which all can express their individuality, develop their personality, and live with dignity. The 1949 Basic Law justly engrained these principles, making human dignity inviolable and establishing Germans’ right to control their personal information. Now the Internet’s rise has created worrisome opportunities for governments and companies to infringe upon Germans’ informational self-determination. Germans must be vigilant of powerful organizations that gather private data in ways that could invite abuse. Individuals should have to opt-in on the collection, retention, and sharing of their digital data. Only then will privacy, self-determination, and human dignity be upheld. “Informational self-determination” may not be a phrase that most American’s have heard of or a phrase that resonates or one that triggers a set of attitudes or even behaviors. However, in the German context this is absolutely essential. In this context, how prepared are Germans to give the USA the “benefit of the doubt” about gathering personal information and private data for the sake of intelligence gathering? Or, as Randall says, place yourselves in the shoes of social media giants such as Google or Facebook whose business model essentially is the monetization of people’s willingness to divulge personal information. You can begin to imagine that the German Private Dignity narrative, if ignored, would create incredible pitfalls to business models like those two. So you can also imagine the application of this narrative in the communications domain. Many countries have narratives that essentially frame and define their role in a region in which they operate. Moving beyond the geopolitical realm, to industry, we see patterns in terms of narratives covering different topical domains that are relevant for different industry sectors. You see narratives around environment and energy, around innovation and intellectual property, around health and obesity, around privacy, and you see these narratives manifesting themselves among different kinds of audience segments. And there are organizational narratives within organizations. So, this all begs a question. There is this concept of master narratives, and we know that they’re important, and we know that they drive attitudes and behaviors. The real question becomes, if you accumulate this repository of wisdom and insight, what can you do with it? Beyond just knowing your audience, how can you shape your audience? What are some of the communication strategies and techniques that can be deployed to leverage the underlying frameworks and structures enabled by these narratives? Hear Doug Randall and his team answer those and other questions when he engages delegates in a workshop on researching, creating and applying narratives at the 6th National Summit on Strategic Communications on May 4-5 in Washington DC.